BOSTON, MA -- Another week in the books for the Eastern Hockey League Premier (EHLP), and we're getting closer to the holiday break. This past week featured 12 out of 13 of the EHLP teams in action, which brought with it plenty of worthy candidates for our weekly honors. 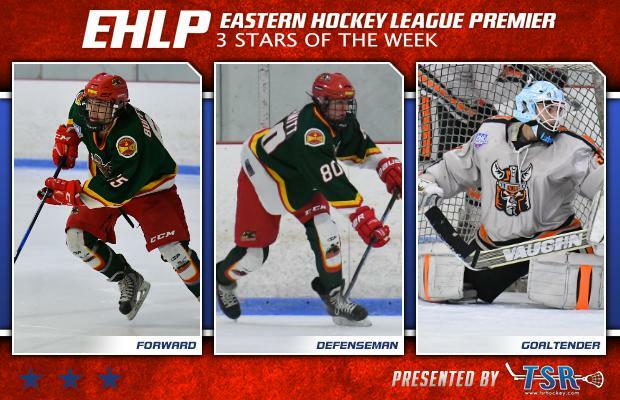 The EHLP is pleased to announce that Geordan Buffoline (Vermont Lumberjacks), Steven Schmitt (Vermont Lumberjacks), and Jake Lakatos (New Jersey Renegades) have been named the TSR Hockey Stars of the Week. There are a total of 14 games on the docket over the next eight days. The final set of TSR Hockey Stars of the Week before the winter break, will be released on Wednesday, December 20th at 10:00am. Catch the EHLP action all season long on HockeyTV. Buffoline and the Lumberjacks won both of their games this past weekend against the Central Penn Panthers. The forward led the way with a pair of goals and eight assists in the two games. The '99 now has a team leading 46 points on the year, with 17 goals and 29 assists. After this weekend, Buffoline also leads the entire EHLP in the assist category. Up ahead for Buffoline and the Lumberjacks this upcoming weekend is a home-and-home series against the Walpole Express. While Buffoline led the Lumberjacks up front, Schmitt followed suit on the blue line. Schmitt recorded a hat-trick and an assist in his team’s 11-5 win against the Central Penn Panthers on Saturday. The defensemen then followed things up with another assist in the Lumberjacks 8-2 victory on Sunday. In total the '01 had five total points on the weekend, and now has ten points to his name so far this season. Lakatos and the Renegades split their weekend set of games with the New England Wolves, with the '99 netminder between the pipes for the victory on Sunday. After the team's 4-2 loss on Saturday, Lakatos stepped up the very next day and stopped 31 out of the 32 shots that came his way to help the Renegades to a 6-1 victory. The win was the goaltender's 3rd of the season as the Renegades will look to rely on him again this weekend when the squad gets set for a home-and-home series against the New York Applecore. 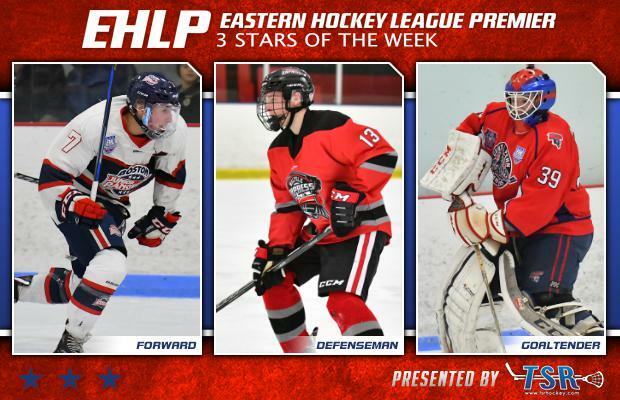 The EHLP would also like to recognize a trio of honorable mentions who recorded hat-tricks this past week, starting with Will Roberts of the Boston Jr. Rangers who had his team's only three goals in their 3-2 win against the Vally Jr. Warriors on Sunday. Prestyn Hoefler also recorded a hat-trick for the New England Wolves in their 4-2 win against the New Jersey Renegades on Saturday. Steven Schmitt's brother, Egan, also had a nice weekend registering a hat-trick alongside his brother on Saturday, and picking up a goal and an assist in the Vermont Lumberjacks' 8-2 win on Sunday.